In recent decades, the vast majority of Americans have experienced disappointing growth in their living standards—despite economic growth that could have easily generated faster gains in their living standards had it been broadly shared. 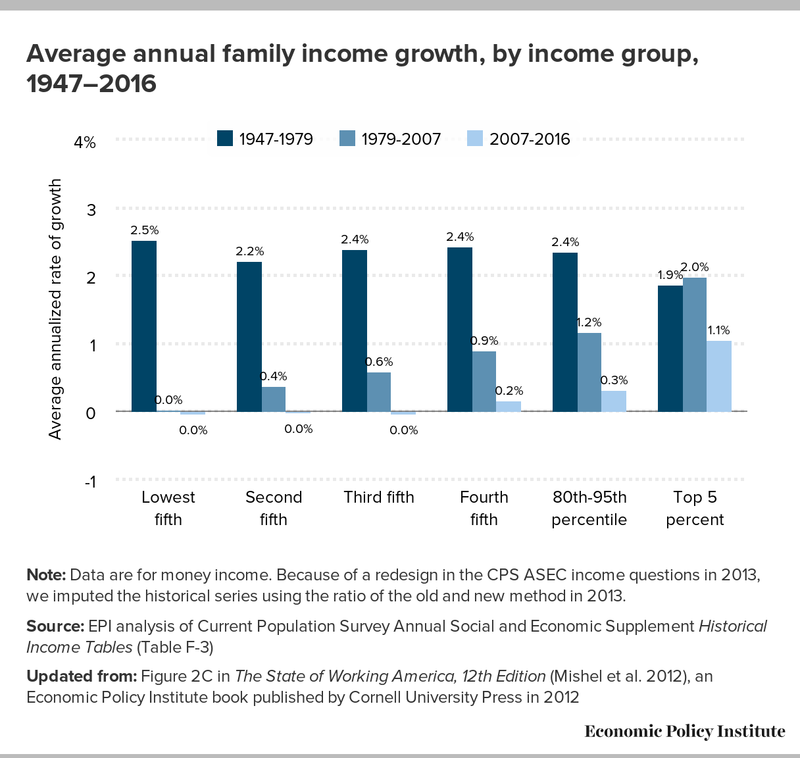 Tuesday’s relatively good news on family income growth over the past year doesn’t make up for this long legacy of rising inequality. This year’s growth is encouraging though not as strong as the previous year in part due to near zero inflation between 2014 and 2015. Unfortunately, the growth in 2016 was also not as broadly shared as it was in 2015. Families in the top fifth of the income distribution grew faster than in 2015, while the bottom 80 percent of families saw slower growth. Another year of decent across-the-board growth should more than fully restore the income losses suffered during the Great Recession for most American families. But, it will barely put a dent in the generation of losses suffered as the incomes for the vast majority lagged far behind the economy’s potential. As with most economic analysis, meaningful assessments of growth of living standards for the vast majority requires specifying benchmarks against which to measure actual performance. We offer up two reasonable benchmarks. The first is how income growth differs for families at different parts of the income distribution. What we have seen since the last business cycle peak in 2007, before the Great Recession hit, is growing income inequality. This week’s news that income growth in 2016 was positive across the board but does not overturn the general pattern of unequal growth that we have seen since 2007. The second benchmark we posit is income growth relative to that of earlier historical epochs. This benchmark shows that in the three decades following World War II, income growth was both much faster as well as more broadly shared than it has been since 1979. The chart below illustrates these points in greater detail. What we see in the dark blue is an early period of far more equal growth. In those three decades following World War II, income growth was relatively strong and uniform across the income distribution. From 1979 to 2007, however, the slower income growth that prevailed was concentrated in the top 20 percent of the income distribution, with most of it going to the top 5 percent. The stair-step pattern shows that each consecutive income group saw an increasing amount of growth. Since the last business cycle peak in 2007, the Great Recession has devastated incomes for the vast majority. It’s only in the last two years that we have made real progress, and we’ve just barely reached 2007 levels for the majority of families. Again, here we see a stair-step pattern—with the bottom sixty percent just below or at zero. The largest income losses occurred at the bottom, with only the very top of the income distribution experiencing any significant gains between 2007 and 2016. Note: Data are for money income. Because of a redesign in the CPS ASEC income questions in 2013, we imputed the historical series using the ratio of the old and new method in 2013. This week’s news about solid family income growth in 2016 offers hope for coming years, but 2016 actually represents a small step back in terms of how broadly shared growth was. Economic recovery finally started arriving for tens of millions of American families over the past two years—we should make sure the economy is nurtured going forward, and not subverted by bad policy decisions, and we should recognize the deep economic hole that most American families are still trying to climb out of.